The proposed site has been vacant since the demolition of Kingston House in 2010, and while planning permission was previously granted for a 99-home, 14-storey residential development, this was never progressed. Marshall CDP has now acquired the site, which sits with the UNESCO World Heritage Site buffer zone and has put forward plans for a “landmark hotel development” opposite Mann Island. The 167-bedroom hotel covers 10 storeys and will also feature a public bar and restaurant at ground floor level, along with a new layby on James Street for servicing and deliveries. Studio Mutt is acting as architect and has designed a primarily brick-clad building which will be accessed via a colonnaded entrance on Strand Street. The hotel is split level hitting 10 storeys at its highest point. According to a planning statement, the proposals for the Kingston House site are expected to create around 120 full jobs and would “generate a new high-quality hotel offer within the city attracting increased visitor numbers and dwell time”. The professional team on the project also includes Curtins, Sandy Brown, Booth King, and Wardell Armstrong. Marshall CDP has delivered a number of other hotel developments in the North West, including Hotel Gotham on King Street in Manchester. It is also currently on site delivering a hotel and casino for Brooklyn on Portland Street, also in Manchester, and has completed Travelodges in Northwich and Burtonwood, Warrington. Elsewhere, it has delivered De Vere Hotels in Edinburgh and Glasgow; a Ramada Encore in Gateshead; a Premier Inn in Halifax; and a Travelodge in Darlington. According to data from Colliers released last month, Liverpool remains one of the UK’s strongest-performing markets for hotels, and is the leading city in the country for hotel revenue per room. Looks a bit rubbish. The brick/cladding and particular the tiny windows do not look right to my eye. Size seems about right, though I think 14 stories would be better and looking at that graphic would not be overbearing either. Just my two pennies worth! Landmark? It looks awful for any plot, never mind such a prominent spot on the Strand, should be laughed out by the planners. First of all I welcome the development of this important site, long overdue. I am not enamoured with it’s design and shape. This is a WHS and the subsequent renderings should reflect that. Ideally if it was possible? Maybe a copy of the old White line building to create a gateway for James Street, ah dream on. Landmark? This needs to be refused at planning. Absolutely horrendous. If their Manchester development is anything to go by then it’ll be even worse in person. Reject! April fools was last week. This can’t be a serious proposal. Red-brick on the Strand? What were they thinking? Pokey windows on the Strand? Are they mad? We don’t want to repeat the mistakes of the past on Liverpool’s greatest thoroughfare. Zero quality. Ugly. Cheap. Doesn’t reflect the opportunities in 2019-era Liverpool. Got to be a rejection. Wow. Awful. Actually worse than the old building. Use stone or modern materials. Totally wrong materials used here. April 04, 2019 at 4:01 pm By That's it? I rather like this. Well done. Royal Albert Dock to the left. Three Graces to the right. If this design was alive it would die of embarrassment. Absolutely horrendous. This can’t surely be considered appropriate or acceptable for such a location? Absolutely horrible design which HAS to be refused by the planners. This corner plot, opposite Albion House and across from the Three Graces needs and demands a quality landmark building, preferably commercial in use. Glass, Portland Stone and modern looking. Why not build an iconic office building and try to tempt Cunard back to the city. So much history of theirs nearby and right opposite James Street station so ideal for workers. This is an abomination. Word on the street is that this is a Travelodge or similar. Please, God, no: it’s about as premium a site as you could hope for. This is just not good enough for such a prime location. Ugly and dated, hope this gets rejected. Rather than being rejected at planning, I understand that this abomination follows pre-application engagement with them. Their interventions soiled the ambitions of the building a couple of yards along, so why anyone would expect them to improve the public realm this time is beyond me. Definitely object. But the people who make the decisions to recommend approval are the ones who count. It’s their output more than anyone’s that needs scrutiny. It’s an affront to the WHS, and the nonsensical weasel words accompanying the images only adds insult to injury. This is back from 2007, when a) Liverpool’s economy was still only emerging from a 30 year decline, and b) when it was already acknowledged that the city had a pending shortage of decent office space and needed to build more. It’s been made all too easy for property developers to profit from the opposite of what the city needs. This design is very depressing. For such a great location we should be seeing interesting designs and an interesting hotel operator offering something unique. Larger windows to offer a light, contemporary space and perhaps some biophilic design would help to make this stand out and offer something different to the Liverpool hotel market. This may not be the best piece of architecture ever but Liverpool is often best appreciated for its long views and ‘vistas’. Looking at the site from Salthouse Dock – Albert Dock quay – which I have just done, the red colour should balance nicely the White Star Building across James Street. This area will become a square, looked at from Mann Island, once the Strand is traffic calmed and trees are planted. I don’t think it’ll jar too badly on this site, and does complement its neighbour. 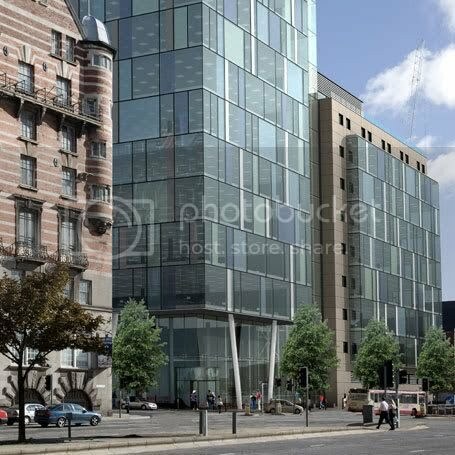 We can’t build another White Star Building and we need something that’ll work for the space that Mann Island looking up James Street will become. Looking at the image again, perhaps the red panels could be ‘toned down’ to a lighter shade? Really not good enough. The design must complement the adjacent former White Star Line building and the wider waterfront. This bland design does not do this. Might be a refreshing change to the tired Signature hotel opposite? This is far to significant plot in Liverpool’s skyline for such an ill-mannered piece of architecture. Hopefully the city region’s new design adviser can get involved and get this scheme rejected as not of sufficient design quality….please! Looks like a cheap block of student housing that would be considered a blight on London Road, let alone the waterfront. Shame on those daring to put it forward. A prime spot from which they’d profit aplenty. And this is what they’d give us. It’s offensive. About time somebody took this site on. People need to be realistic, nobody is ever going to build another White Star building and a development of this type will bring continued investment into our city which needs to be encouraged. I think the architects have taken into account the need to pick up the fabric and proportions of surrounding buildings and in my opinion it works. A welcome relief from the soulless glass and cladding developments we have had recently. Landmark indeed! I thought the city-region had a design champion these days? Do they have no sway over this type of tat? Such a prime site ready to be butchered. I think this is an interesting design. It demonstrates creativity and has a strong narrative, the red brick is clearly a response to the ‘Streaky Bacon Building’ opposite. Could be a bit taller but I think it’s great. Difficult to tell exactly from these images but it looks quite sophisticated to me. It looks well proportioned with an interesting approach to the facade – don’t really understand most of the comments myself. Stop building crap buildings Liverpool – you can do better than this. Traditional styles far outweigh these modern cheap approaches. That looks hideous! Particularly opposite the beautiful old White Star building.